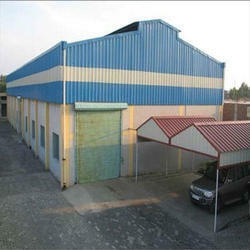 Pioneers in the industry, we offer pre fabricated factory shed from India. re Fabricated Factory Shed offered comes in sturdy and lasting construction finish and can be made available in different design specifications to choose from. Further, these prefabricated structures comprise steel framework linking up H section, Z section and U section and can be provided with options of different types of roof and wall options as demanded from us. Some of its features include available in superior grade steel finish for lasting durability; column & beam comprising welded or hot rolled H-section steel; wall & roof support provided in form of EPS, Rockwall, PU sandwich panel ad others. Looking for Pre Fabricated Shed ?